Why Choose Beyond Defeat / Christopher Baker? Christopher Baker welcomes athletes of all fitness levels and experience. He is a Road Runners Club of America (RRCA) certified running and triathlon coach. Since 1958, the RRCA has been dedicated to growing the sport of running. It is the largest and oldest National association of running organizations. The coaching Certification Program aims to create a knowledgeable and ethical distance running community for all ages and abilities. This Certification is a systematic program which combines ethics guidelines, First Aid and CPR training, in-person coursework and rigorous testing. It adds up to give you peace of mind that you will be speaking to an expert. 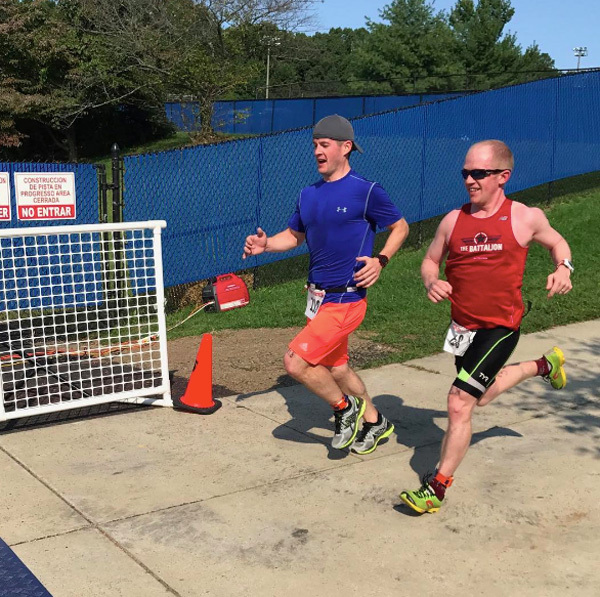 Coach Baker brings with him knowledge of exercise physiology, training program construction, strategy for environmental factors, nutrition, correct running form, sports psychology to help bust through roadblocks and injury prevention. He is qualified to work with any level of runner seeking to improve. But it’s not just that. Coach Baker brings with him a wealth of first hand experience garnered from hundreds of races completed over the last decade. He is a 3-time Ironman and distance runner. He has competed in both the Boston, and NYC marathons on multiple occasions. Guided by a simple mantra that our human spirit is “beyond defeat” Coach Baker is living proof that anything is possible. Known as simply “Baker” to his friends and colleagues, he possesses an infectious and undeniable powerhouse of energy. Baker got into running because of a dare. While working at Rolex, the then President Mr. Allen Brill dared him to run the New York City Marathon. The rest is history. Over the years, his passion grew as did his running knowledge. Baker credits his exponential learning curve to his coaches. From friendly suggestions to formal coaches, his running education has taken many paths and mentors. These individuals helped give him the drive to achieve more within the sport and to pay that help forward. He shares this drive and commitment, cultivating that passion with everyone he comes in contact with. When you meet Baker, you’ll know that you’re in unique company. If you’re willing to do the work, he will be there every step of the way.